Yes, this is my second post of the day, but I don’t think I’m going to have time to post anything before I have to leave for work in the morning. The area along Grand Avenue just northwest of downtown Phoenix is experiencing a slow but steady renaissance. A lot of the old abandoned buildings are being converted into art spaces, boutiques and small cafe’s. It’s still very much a work in progress, and it was pretty much deserted when we were there on Saturday. But at least the area is getting spruced up and it looks much more interesting now. One of the challenges I faced was trying to capture the facades of the buildings without having a true fish-eye lens. I couldn’t step back far enough from the building to capture the facade square-on without standing in the street. If I had crossed to the other side of the street and shot from there, the sun would have been right in the lens–no good. So most of the architecture shots were like this one, taken from an angle. It creates some perspective issues, but it is what it is. I don’t mind it myself, but those purists out there might have a problem with it. HDR created from three bracketed photos (-2.0/0.0/+2.0) processed in Photomatix v4. Post-processing in Topaz Adjust / DeNoise with Paintshop Photo Pro X3. 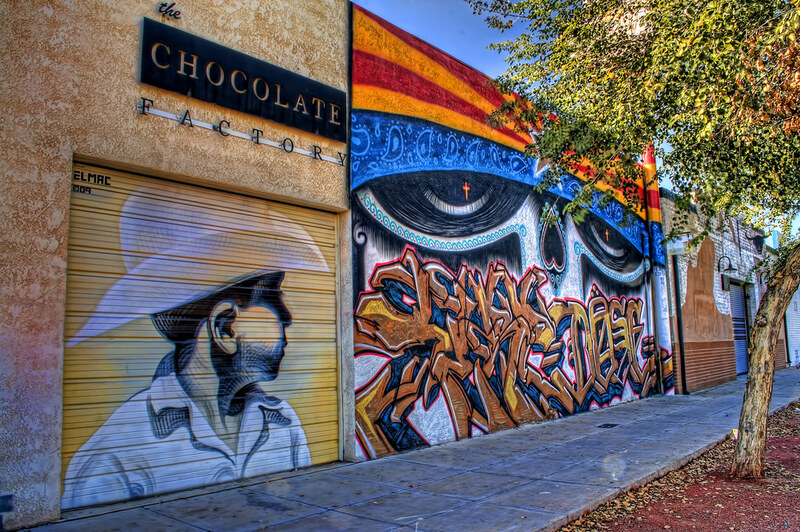 This entry was posted in Information, Processing, Shooting and tagged Arizona, AZ, camera, Chocolate Factory, D5000, graffiti, Grand Avenue, HDR, mural, Nikon, Paint Shop Pro, photography, Photomatix, Smith Radiator Exchange, software, Topaz, urbex. Bookmark the permalink. that is a great shot….where is this on grand? i don’t ever remember seeing it….did you try any of their chocolates?